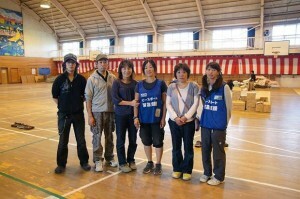 As of October 11, all evacuation centres of Ishinomaki have been closed. Peace Boat plans to continue supporting the local community such as through provision of newspapers to temporary housing. Report following the activities of Cleaning Assistant Director Ichijo Kenji (Part 2). Follow-up Report: Visitors to “Kizuna no yu” and “Fudou no yu” exceed 3500! Over the past two weeks the number of visitors to the public baths, “Kizuna no yu” and “Fudou no yu” that were opened to the public on August 22 exceeded 3500 people! 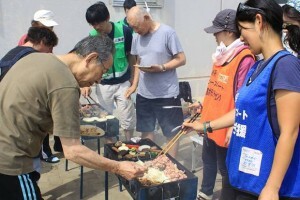 A new style of meal preparation– BBQs, where ingredients and equipment (rather than ready-made meals) are brought and volunteers and residents cook together in an environment of regained independence. 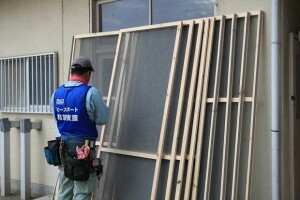 Flies and mosquitoes are increasing in the disaster affected areas, and Peace Boat is now working to install fly screens in evacuation centres throughout the Ishinomaki region. 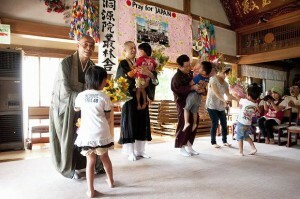 On August 7, the closing ceremony of the Dougenin Temple evacuation center was held. 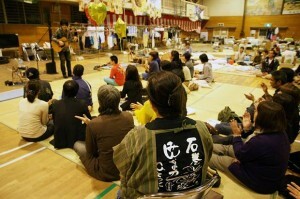 Established soon after the earthquake and tsunami, this centre has helped to protect the residents of Ishinomaki.